Stephen Covey’s timeless self help classic The 7 Habits of Highly Effective People, was really the start of so much of the coaching and self help industry. I can personally attest to the value of his teachings and the power behind his simple, yet effective, 7 Habits. Trying to keep them in focus is a challenge at times, but I know that doing so helps me with my business and my life. That said, I thought it would be an interesting experiment to see how the 7 Habits apply to building websites. We all want our websites to be effective, right? So if the 7 Habits can make a person and/or their business effective, why not a website? Your site needs to take the initiative to try to turn a visitor into a client. How? By talking to the pain points. Address the issues they need to be solved, and show them why YOU are the right person or company to do it. What’s your goal with the site? What part does it play in your overall business or marketing plan? You need to really know what you want people to do when they get to your site, before you figure out how to get them there. Do you want them to buy something online? To sign up for your online course? To come through the front door of your brick-and-mortar? To pick up the phone and request your services? Each of these is fine - you just need to determine which is the best use of your website. Having specific goals for the site will help here. Think S.M.A.R.T. goals that are measurable and specific. Once you have your “end in mind” you can focus on that and nothing else. How do you go about making that “end” a reality? What is the ONE THING your website needs to focus on in order to make that happen? Should your content talk about that one thing? Should your homepage draw attention to that one thing? Should your marketing be triggered off of that one thing? Have a plan based on the focus of the first thing you need your website to do, and do it. For instance, is the first step in becoming a customer, for the site visitor to offer up their email address to you in exchange for something that will help them with their number on pain point? Is your site setup to collect the email address in a way that will actually WORK? Is there a call to action on the homepage? Is there an epic blog post to attract organic traffic to that pain point, which also has a call to action? That’s focusing on the first things first. One of the most tried and true methods of generating leads from a website is to use a “Lead Magnet” as an offer in exchange for contact information - usually an email address. This method is used everywhere. Too much, to be honest. So in order to use it effectively you really need to think “win/win”. What’s in it for THEM needs to be valuable enough to cut through all the noise. People are less and less willing to just give away their email address. Your free offer needs to truly help them solve a problem or guide them down the path to the solution. This one gets a bit more technical. In this case we’re talking about Search Engine Optimization - or SEO. In order for Google and other search engines to find you and serve you up in a search query - they need to understand your site, your business, and what you’re all about. But before you can get the search engines to understand YOU, you need to understand your clients - and specifically, you need to understand what they are searching for and how they search for it. Keyword research helps here. You’ll learn what search terms are being used to actually find your business and businesses like yours (i.e. ; your competition). And take note: knowing what they are using to find you may or may not be what you want them to find you for. When they find you using a specific search term, are they staying on your site and buying from you or learning from you - or are they leaving right away and continuing their search? Understanding how people search for your services and products will help you to be better understood by Google and the other search engines. I believe all businesses need Joint Venture Partners of some sort. It is difficult enough to find new clients on your own - why not partner up with someone who has the same client “avatar” as you do, and try to work together to not only “get” that client - but to truly HELP that client with their needs. Your website can be setup to attract and nurture these relationships too. You can make a simple landing page that is geared toward your potential JV Partner and then use Facebook marketing to try to drive some traffic to the landing page. One good JV partner is worth their weight in gold! Keep up to date on the latest trends in digital marketing. Learn what you can with regard to the tools you need to do email marketing; the latest methods of facebook marketing; what’s new in design, etc. Udemy is a great resource for taking a free or low cost course. Moz, HubSpot, Neil Patel and SEO.com are great resources for all sorts of digital marketing and search content. Get a partner to help you keep things moving forward. A digital marketing agency like Wiltwyck Web Design can help with the little things - by way of one of our care plans - but also with the heavy lifting with SEO and other traffic generating ideas. Imagine if you had the perfect work/life balance. 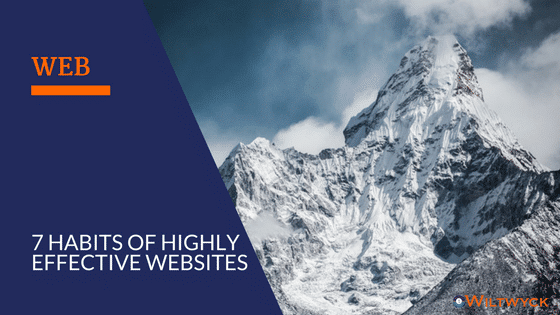 Where your website was so effective that it helped you handle so much of the marketing and lead generation that it freed you up to be more effective yourself. It can happen. We can help make it happen.